Zion Market Research has published a new report titled “Medical Device Coatings Market (Hydrophilic Coatings, Anti-Microbial Coatings, Anti-Thrombogenic Coatings, Drug-Eluting Coatings and Other Coatings) for Orthopedics, Neurology, Cardiovascular, General Surgery, Gynecology, Dentistry and Other End-users: Global Industry Perspective, Comprehensive Analysis, Size, Share, Growth, Segment, Trends and Forecast, 2015 – 2021.” According to the report, global demand for medical device coatings market was valued at around USD 8.1 billion in 2015 and is expected to generate revenue of USD 11.8 billion by end of 2021, growing at a CAGR of around 7.8% between 2016 and 2021. Medical device coatings are typically used in the healthcare industry; it helps to modify the surfaces of devices, equipment, and implants. Medical device coating helps to improve the surface properties of medical devices. The increase in a spread of contact diseases, especially in healthcare facility providing sites has resulted in an increase in demand for medical device coating. As, medical devices are constantly used and come in constant contact with human body, after a particular period of use these devices can act as a medium for the spread of various diseases. Medical device coatings help to increase the overall utility of medical devices. Global medical device coatings market is primarily driven by the growth of medical device industry in Asia Pacific region, especially in China. Another major driving factor is increasing demand for minimally invasive procedures coupled along with technological innovations. However, volatile raw material prices and strict government regulations implied on this industry are major restraints that may limit the growth of the market. 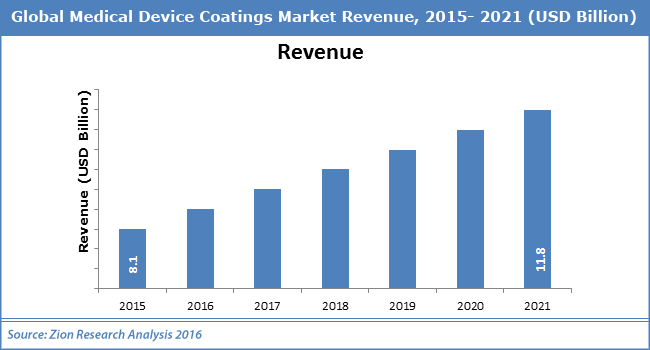 Nonetheless, growing demand for nano – coatings as the medical device coating material is likely to disclose the new avenues for medical device coatings market in the near future. The medical device coatings market is segmented on the basis of different products including hydrophilic coatings, anti-microbial coatings, anti-thrombogenic coatings, drug-eluting coatings and other coatings. In 2015, the anti-microbial coating was the largest segment in medical device coatings market and accounted for largest share of the total market. Additionally, it is expected to continue its dominance and be the fastest growing segment in the global market over the forecast period. Hydrophilic coatings segment is expected to witness the fastest growth due to the adequate wetting ability provided by them which helps in smooth lubrication which in turn helps in its usage in the broad range of medical devices. Orthopedics, neurology, cardiovascular, general surgery, gynecology, dentistry and other are the key end-user segment of the global medical device coatings market. The general surgery end-user segment dominated the market in terms of revenue while orthopedics and cardiovascular devices segment followed general surgery segment. The cardiovascular device is likely to have a significant growth within the forecast period. North America, Europe, Asia-Pacific, Latin America and the Middle East & Africa are key regional segments of global medical device coatings market. North America is expected to remain the dominant region over the forecast period in 2015. Europe was the second largest market for medical device coating in 2015. Asia Pacific is expected to be the fastest growing and the largest revenue contributing region in medical device coatings market during the forecast period. Moreover, Latin America is also expected to show noticeable growth for this market in the years to come.